The only thing better than a creamy, bloomy Brie (or Camembert) would be a baked Brie. 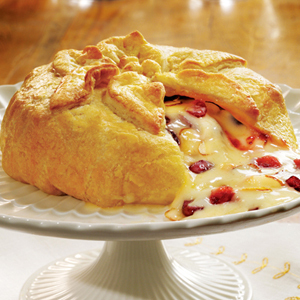 There is just something about the fusion of warm, melted cheese, toasted almonds, moist cranberries, tangy apricot preserves and a sweet drizzle of honey, all wrapped in a buttery pastry crust -- delicious! The question of whether to remove the rind of the cheese, or not, is one for the ages. Some do, some don't; no matter -- every Brie en Croute is divine! Preheat oven to 400*F. Place the dried cranberries and boiling water in a bowl and set aside. Roll out the puff pastry on a lightly floured surface. Trim the corners of the pastry to make a rough circle; reserve the scraps of pastry. Lightly brush half of the melted butter over the surface of the pastry then spread the apricot preserves over pastry, to within ½ inch of the edges. Sprinkle the toasted almonds over the pastry. Drain and pat dry the cranberries; scatter cranberries on pastry. Drizzle the honey over all. Place Brie in center of pastry. Draw up the pastry around Brie to make a parcel. Firm the pastry smooth and flatten the edges against the cheese, trimming off extra pastry if needed. Discard these pastry scraps. Brush top of pastry parcel with remaining butter. Turn parcel over and place on a baking sheet lined with parchment. With the scraps of pastry saved from trimming into a circle, cut small shapes (leaves, stars, etc.). Decorate the top of the parcel with the cut pastry scraps, press firmly to seal. In a small bowl whisk together the egg white and water; brush egg wash over pastry. Bake for 20-25 minutes or until the pastry is golden brown. Remove from oven and let stand thirty minutes. Serve with apple slices and toasted baguette slices.